I couldn't resist copying the poem In Flanders Fields which though pompous at times is very evocative too. Poppies have never been the same after World War I.
I made some researches today about Remembrance Day though I think I won't be able to teach anything about it to my pupils this year and I came across the picture above of a 18-year-old English private who died in 1916 in the Somme. 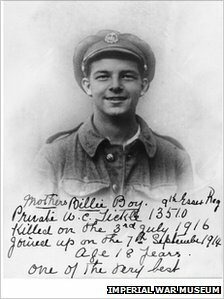 His mum called him Billie Boy in her moving comment and wrote he was one of the best. The best and the not so good died in this not so Phoney war.